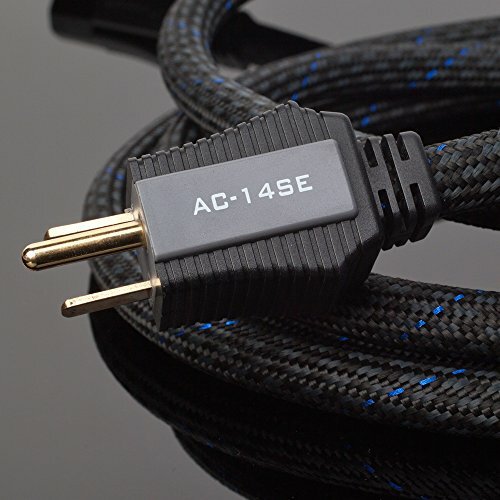 Pangea Audio's AC-14SE MkII is the ultimate affordable AC power cable for source components. This fourteen gauge cable uses three conductor groups consisting of a combination of solid and Litz conductors. The large-gauge center conductor is made of solid Cardas Grade One Copper. Surrounding this conductor are six cores consisting of one medium-gauge solid OFC copper conductor, which in turn is surrounded by six Litz conductors. The net effect of Jay Victor's patented design is that every conductor is individually insulated. The braided shield is made of silver-plated copper for lower noise. The original version of AC-14SE used a center conductor made from PCOCC copper, an extremely high purity form of Japanese copper. The new MkII version goes a substantial step further, upgrading to no-compromise Cardas Grade One Copper, which George Cardas of Cardas Audio developed for his own premium cables. Pangea Audio's AC-14SE MkII Signature Edition power cable is specifically designed for source components, which do not require the same large amounts of current as receivers, amps and subs. The AC-14SE provides more than enough current while offering multiple shielding and other features that facilitate extremely clean and noise-free power. Pangea designed the AC-14SE MkII specifically for wide-band delivery of power to line-level AV components. It will enhance the performance of preamps, CD players, DVD players, DACs, and other line-level components. Superior flexibility means easier installation, and the lightweight design doesn't impede the effectiveness of isolation devices. The AC-14SE MkII's 24k gold-plated contacts offer superior electrical contact. Special two-shot molded connector bodies protect vital AC connections from oxidation and corrosion for long life. Pangea Audio power cables offer the perfect balance of power, shielding, and flexibility for audiophile components.